A RM110 million transformation of the Prime Minister’s Office (PMO), into a certified green building is on track to be completed by mid-2014. This is a private finance initiative (PFI), by KFM Holdings and its energy management solutions partner Schneider Electric, aiming at achieving up to 40% energy saving. I have attended numerous roadshows by Schneider Electric and they are actually very aggressive in promoting energy management solutions for commercial buildings and other industrial applications. 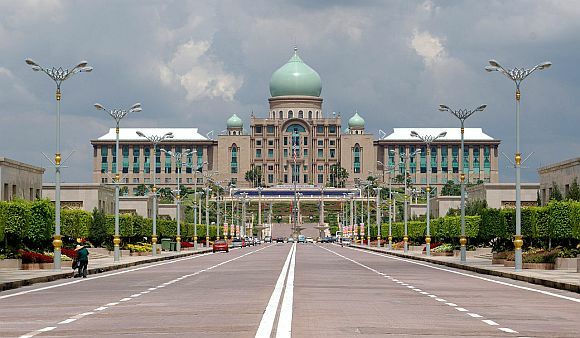 Front view of the Prime Minister's Office (Perdana Putra). Image source, with public permission. The good thing about such initiative is that the government has no obligation to pay the private party until the private party proves and delivers its products or services. So until the initiative is proven to have achieved GBI platinum rating certificate, there will no payment from the government. I like that! which are components in the GBI framework. According to the companies involved in this project, the bulk of the fund will be spent on energy efficiency. The retrofitting project is estimated to save RM2 million in energy usage per year as compared to the current RM6 million annual bill of the PMO and is the largest retrofitting project for government buildings in Asia so far. TheGreenMechanics: It is actually a very interesting venture when you set No-saving-no-payment condition in the initiative. We have been approached previously by a West Malaysia-based company specialising in energy saving and the presentation actually looks attractive. But many bosses are still unwilling to invest in saving. The project costs RM110 million and electricity bill saving is RM2 million per year. Disregard the environmental benefits and better work-space quality, the financial payback time will be 55 years. Only government is able to do this kind of investment. It will be tough for private sector thou. Back to those "bosses" it is still dollars and cents. Such initiative would normally involve cash flow pre-agreed with the financier. It's understood that in this particular PMO project, financing was secured from a local bank thanks to Schneider Electric's fine track record. Not sure bout KFM though. Back to the bosses, financial payback was calculated to be around 6 to 7 years which is very attractive. While it had nothing to do with getting green certification, it's much more attractive financially.